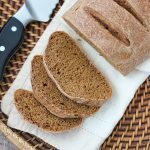 Homemade black bread, often called Pumpernickel, is so hearty and rich in flavor, with different notes and flavors coming through the crunchy crust. The texture is dense but not heavy, just perfect to enjoy with a bowl of soup or a smoked salmon sandwich. As a Slavic girl, black bread, aka Pumpernickel bread, holds a special place in my heart. 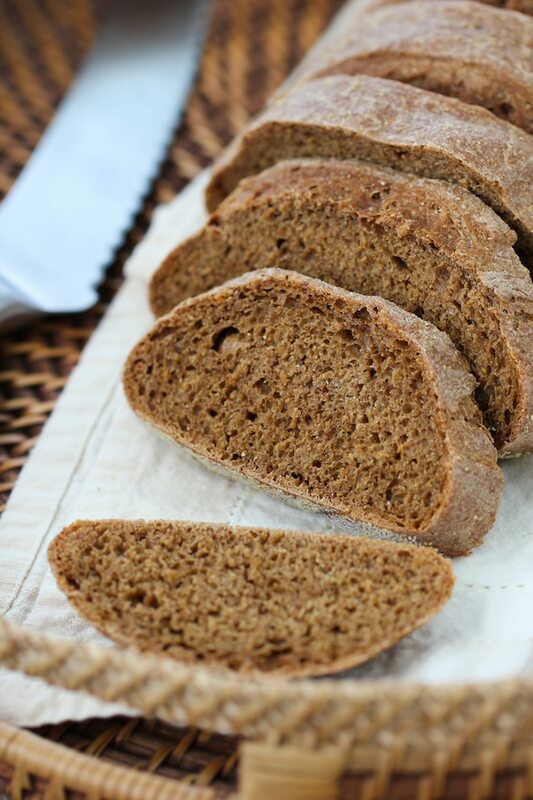 Some soups don’t even taste right to me without a slice of flavorful black bread to go along with them, such as Borsch or Shchi. I’ve worked on this recipe, tweaking, making changes, and trying to make the perfect combination of flavors and texture and keeping it all as simple as possible too. 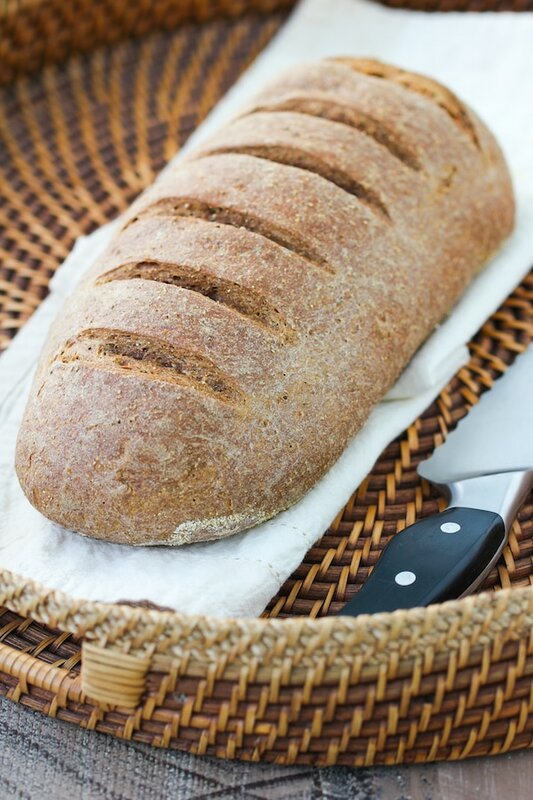 I wanted it to have a rich, hearty flavor, so I used unsweetened cocoa powder, coffee, molasses and ground caraway seeds to add both color and all sorts of great taste and smell throughout the loaf. 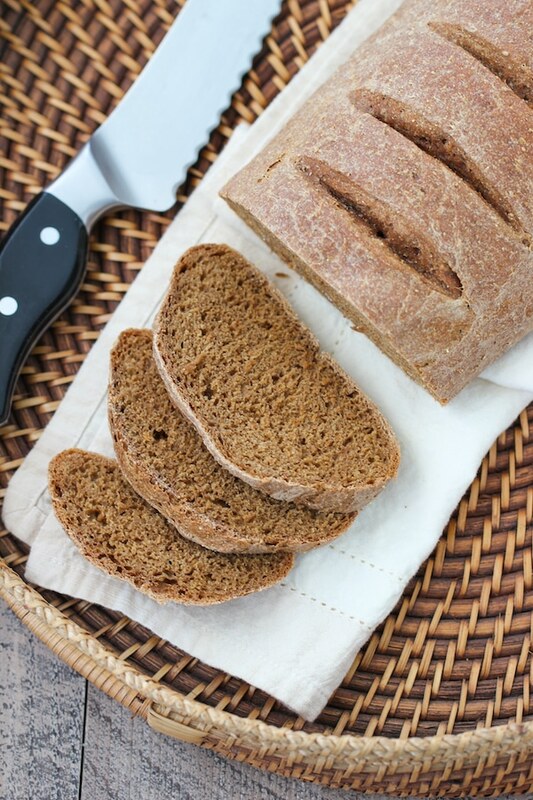 The ingredients may sound a little strange, but they all marry so well together and give it the flavor that Pumpernickel bread is so well known for. I really like the convenience of this recipe – mix up the dough, leave it overnight in the refrigerator, then shape and bake the next day. 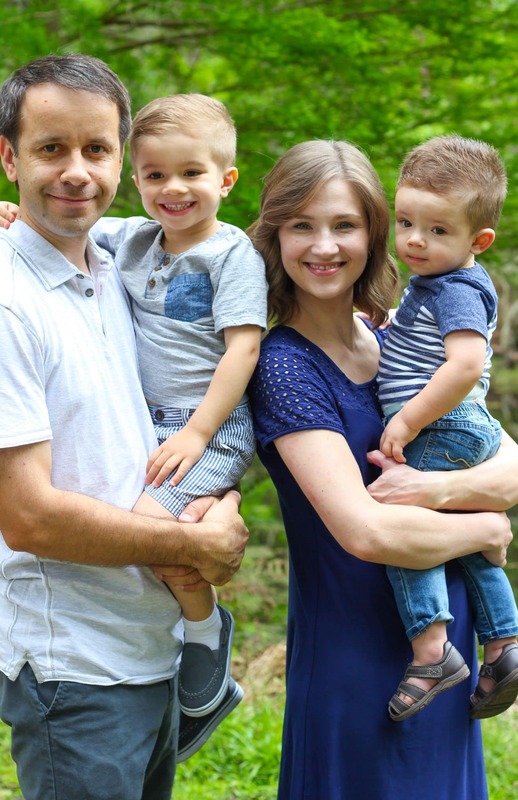 Making the dough is really easy, there is very little kneading involved – my little toddler boys help me make it. 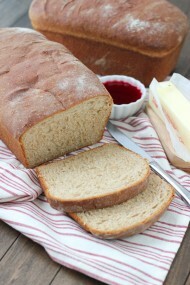 Even if you are new to bread making, I think this is a great recipe to start with. Get your butter out – I can never resist having a slice slathered with butter while the bread is still warm. Try this with a bowl of Borsch or top it with some salmon gravlax. 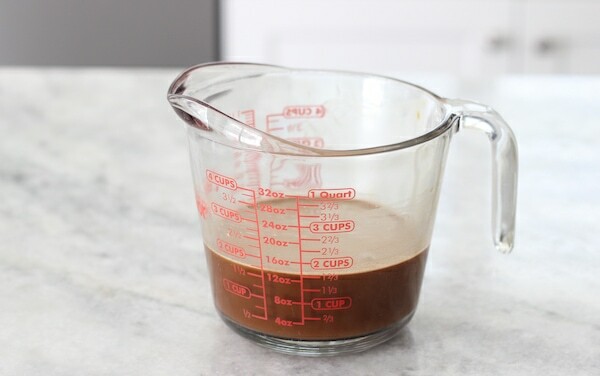 In a large bowl or a large measuring cup, combine the water, yeast, salt, molasses, instant coffee, cocoa powder, caraway seeds until everything is evenly mixed. 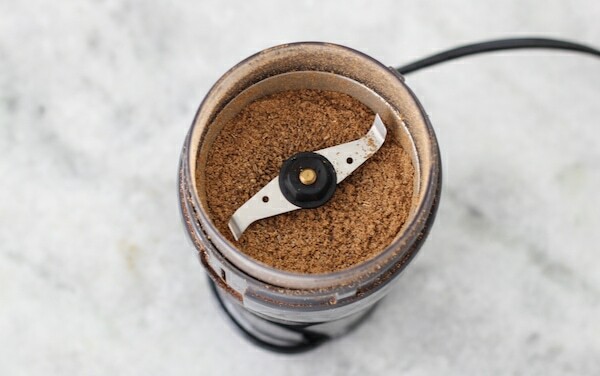 I usually buy caraway seeds whole and then grind them up finely in my coffee grinder. 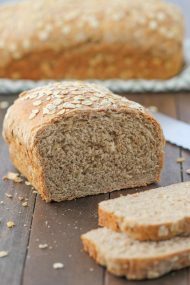 You can even add some whole caraway seeds to the bread dough or sprinkle some on top of the bread before baking it. 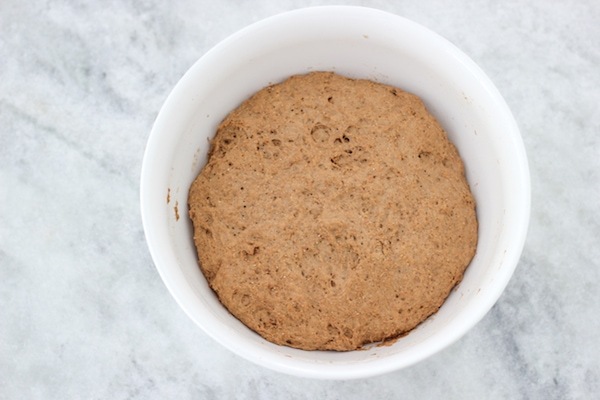 In another large bowl, combine the whole wheat, rye and all purpose flours. Mix to combine. 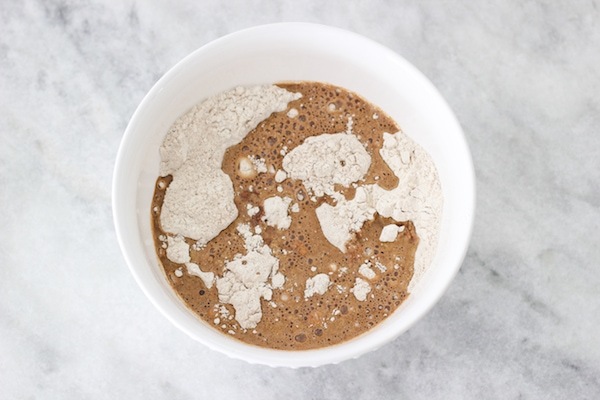 Pour in the liquid ingredients into the dry ingredients and use a wooden spoon to mix all the ingredients until they come together. You can use your hands to mix the dough or use a standing mixer fitted with a dough hook attachment. You don’t need to knead the dough very long at all, just enough so that the flour is all well incorporated into the dough. The dough will stick slightly to your hands; that is normal. Don’t add too much flour, or the bread will be very dense. After the dough rises and then chills, it will be much easier to handle and won’t stick to your hands as much. Cover the bowl with plastic wrap or a clean towel. Set aside to rise at room temperature for 2 hours. After the dough has risen for 2 hours, place it in the refrigerator overnight. You can even keep it in the refrigerator for a few days, but I think the best results are when you bake it the next day. The next day, take the dough out of the refrigerator. It will slowly continue fermenting and rising in the refrigerator and will before tender and fluffy. Preheat the oven to 400 degrees Fahrenheit. Place a pizza stone in the oven to heat up while the oven is preheating. If you don’t have a pizza stone, place a large baking sheet upside down into the oven instead. 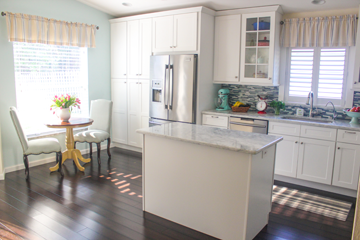 Use a large cutting board or a baking sheet and top it with parchment paper. Sprinkle some cornmeal in the center of the parchment paper, so that there is cornmeal area a bit bigger than the bread loaf will be. 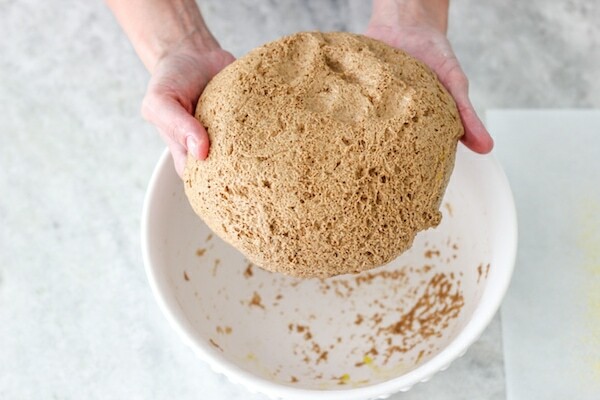 With damp hand, take the dough out of the bowl and knead it very slightly, folding the dough underneath itself until you have an even ball, then shape it into an oval loaf. Place the bread loaf on top of the cornmeal. 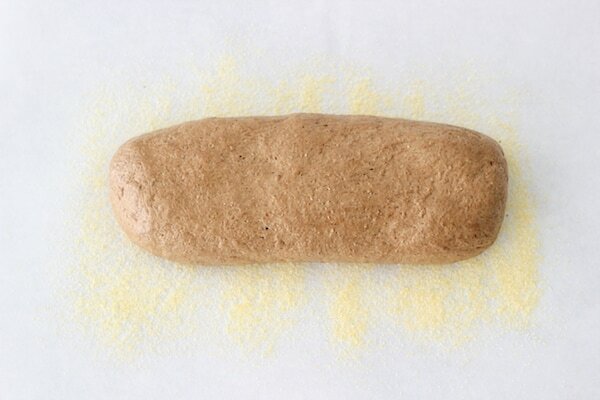 Set the bread loaf aside to rise at room temperature for about 40-50 minutes, or better yet, in a warm room. I actually put the bread in our hot Floridian garage to rise, which makes the rising time faster and more effective. Slash the top of the bread with diagonal or straight cuts across the surface of the risen bread. 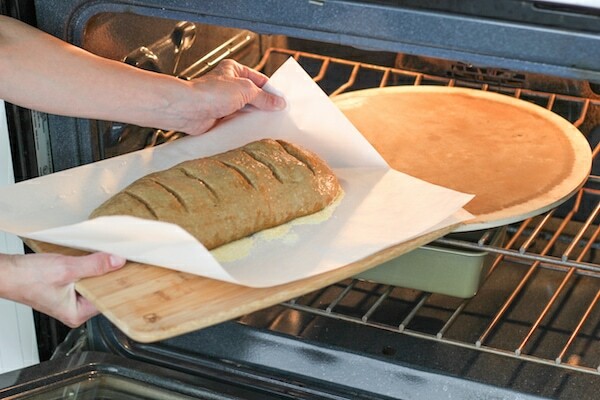 Use the parchment paper to pull the bread from the cutting board or baking sheet and transfer to the hot pizza stone in the preheated oven. Place some sort of rimmed baking pan underneath the pizza stone. 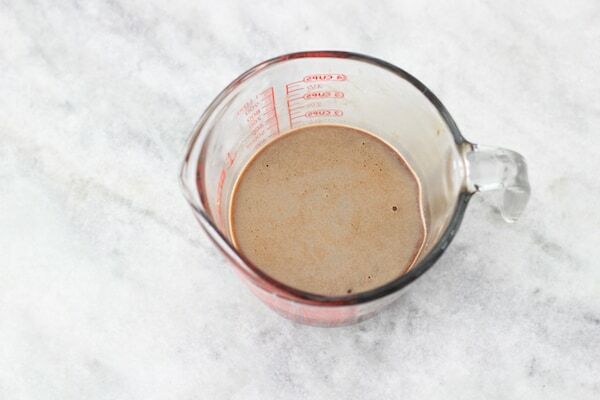 Pour in 1 1/2 – 2 cups of hot water into the baking pan. This will created steam in the oven as the bread is baking and will create a nice crust on the outside of the bread as it’s baking. 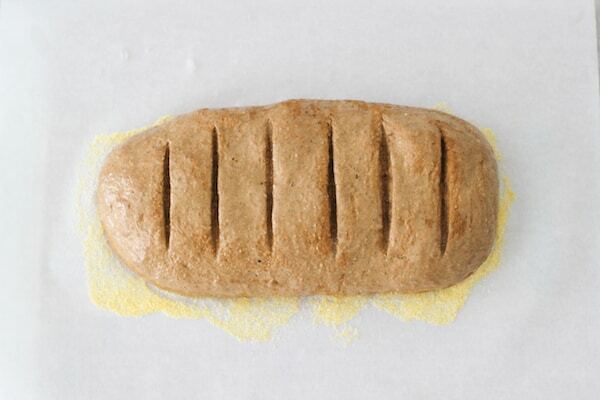 Bake the bread in the preheated oven for 40-50 minutes, until browned and firm. 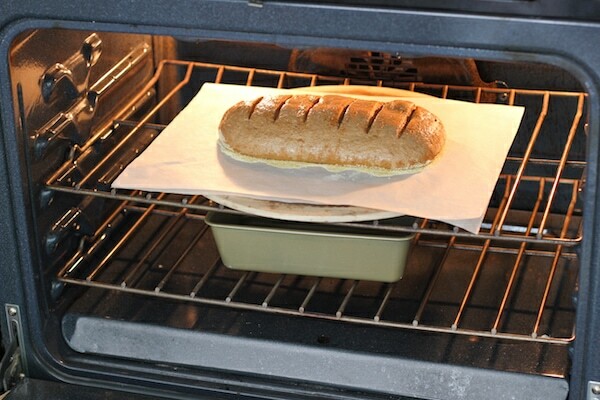 Take the bread out of the oven and let cool on a cooling rack before slicing. 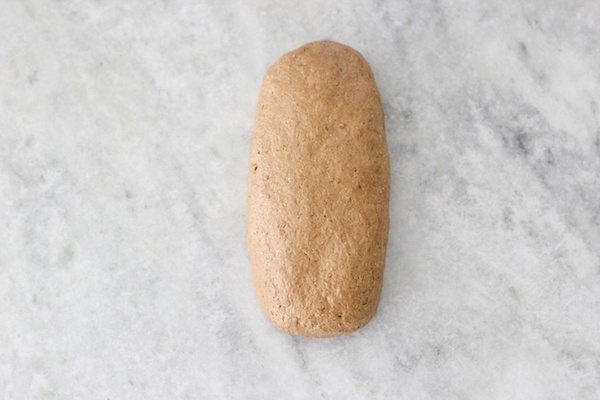 Store the bread at room temperature, covered or in a bag or container, for a few days, then store in the refrigerator. 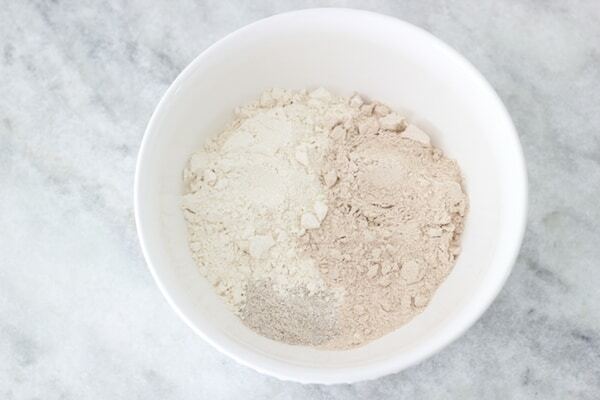 In another large bowl, combine the whole wheat, rye and all purpose flours. Mix to combine. 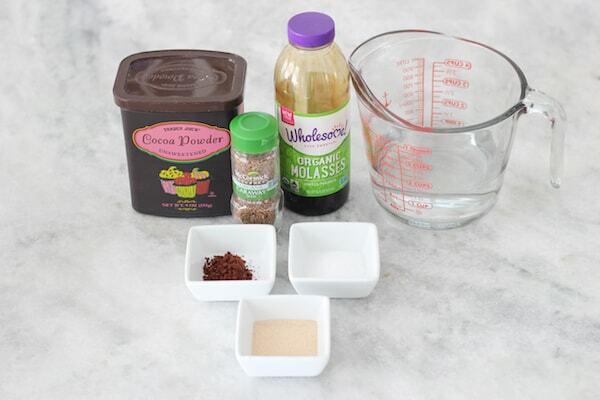 Pour in the liquid ingredients into the dry ingredients and use a wooden spoon to mix all the ingredients until they come together. 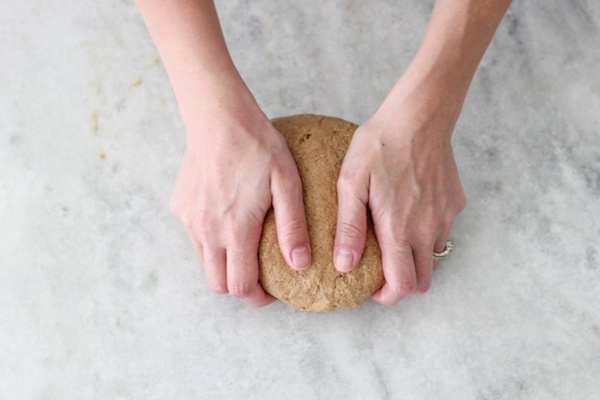 You can use your hands to mix the dough or use a standing mixer fitted with a dough hook attachment. You don’t need to knead the dough very long at all, just enough so that the flour is all well incorporated into the dough. The dough will stick slightly to your hands; that is normal. Don’t add too much flour, or the bread will be very dense. After the dough rises and then chills, it will be much easier to handle and won’t stick to your hands as much. Wow looks so so perfect Olga! I’ll have to try this recipe!!! Thank you for perfecting it for us! This looks wonderful! I’ll purchase some caraway seeds and bake it this week, I know it will be delicious! Olga, I have a question about step six: do I need to punch the dough down before placing it in the refrigerator? 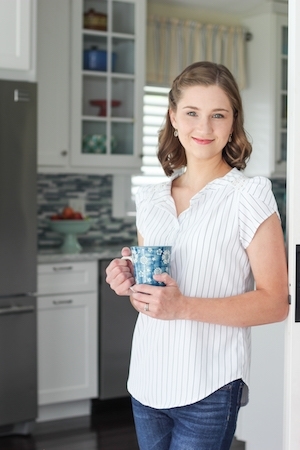 I want to make sure I understand all the steps before baking. Thank you, Marina. I hope you enjoy the bread! Nope, you don’t need to punch the dough down, just put it into the refrigerator. 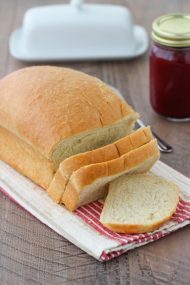 A request for a recipe of Costco styled Country french bread please! Yum, I love French bread too:). I’m so glad that you enjoyed the bread, Alla. Thank you so much for taking the time to write. Thank you for the great recipe. 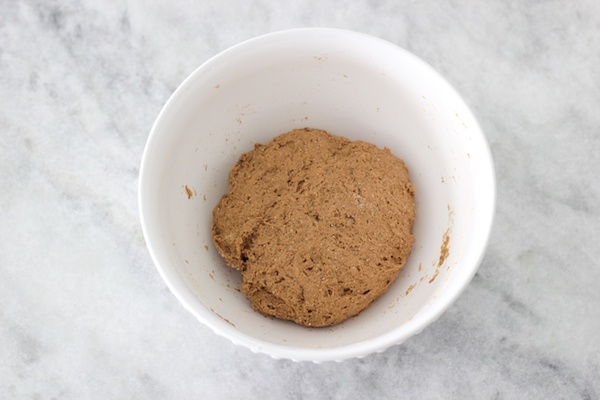 I have used my bread maker machine to make the dough using all the ingredients in your recipe. Then I followed your directions (overnight in the refrigerator, etc). It turned out beautiful and so tasty. The flavor, the texture – just like from the Russian store, even better!!! My husband told me that I should make the black bread using this recipe from now on, he loved it so much as well! I used different recipe before this one. I have never tried it, Rosemary. I think it should work Oksana. I’m so glad you were happy with the bread, Oksana! Thank you for taking the time to write and share your feedback. I love when Pumpernickel Bread is dense and chewy too:). Olga, I love your Shchi recipe! Can you PLEASE ( oh please ) give a recipe for Borodinskiy bread? ?